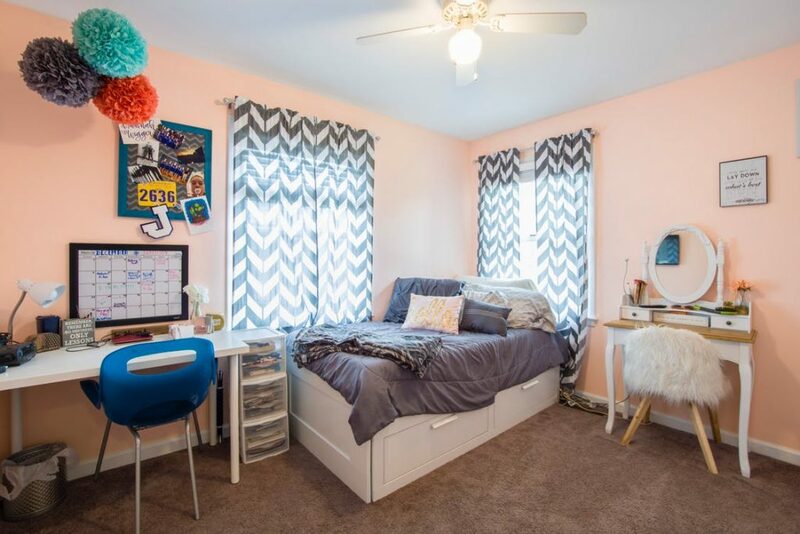 If you have a teenager, or even a couple of them, particularly teenage boys, you will likely notice ‘teen bedroom syndrome’ occurring in your home. Girls can be guilty of this too. We’re talking about how they are old enough for them to be responsible with their space, but perhaps not disciplined enough to keep it tidy. We’ve often seen the chair with clean laundry that sits in perpetuity, the unmade bed, the closed curtains and the television or computer station in full view of the bed. Of course, sometimes, you wish that this room was taken care of a little better. In no way are we accusing your children of being slobs of course, almost everyone goes through this period as teens, and if yours haven’t – hey, that’s fantastic! But if you want to know how to overcome this and set normative examples for them to follow, consider the following advice. It might just help the entirety of your home shine true as you desire. Ensuring the room gets air and ventilation is important. Letting your teen know about this is essential. A little ventilation can help the room stay fresh, and can stop that ‘oppressive’ feeling of discomfort that occurs when stale air sits in a room for two long. Not to mention any food that is brought into this room will often has its own lingering smell. Have the window cracked open, and purchasing an air filter for that room can also be worthwhile. A little plant and odor-killing spray can also help the room stay fresh, especially after their long sessions of gaming or watching movies. Of course, these are responsibilities you should be giving them, not conducting yourself, as that sets a bad example. We know that roller blinds help control light in your bedroom, so it might be worth installing these to ensure that no heavy curtain takes up too much of the frame, and that privacy can also be achieved even when letting in ventilation or light in the evening. This can be especially useful on first-floor bedrooms. A laundry basket can be important to stop dirty clothes from being thrown on the floor. Dividers in the bedside table drawers can discourage junk from being thrown in there, as well as a waste paper basket in the room. Properly showing your teen how to fold their clothes and hang them, and respect their wardrobe space is a great lesson to teach. Also, have them clear out their wardrobe and try on everything they own to ensure it all fits from time to time. It can help you avoid allowing them to keep old and unnecessary garments for years on end. You might be a cool parent. You might get on well with your child. But it’s important not to give an inch when it comes to how organized they keep their room space. Of course, there’s no need to be odd or draconian. Simply looking every few days with a cursory glance can ensure they are keeping it tidy. Do not allow them to filthy up the place. This will lead them to internalize standards that will truly help them the moment they leave for university or get their first apartment. Trust us. It’s worth it. With these tips, you’re sure to avoid the ‘teenage bedroom syndrome’ in your house.